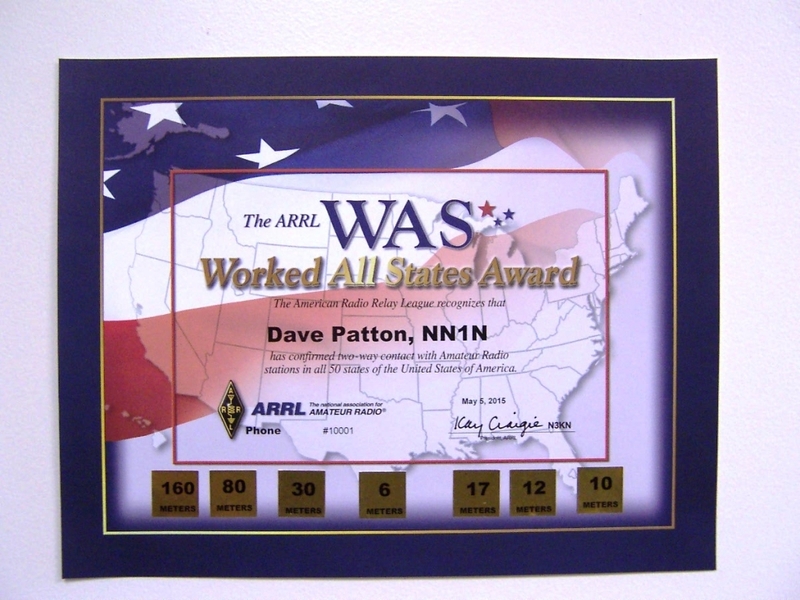 1) ARRL’s most popular award is the Worked All States Award. 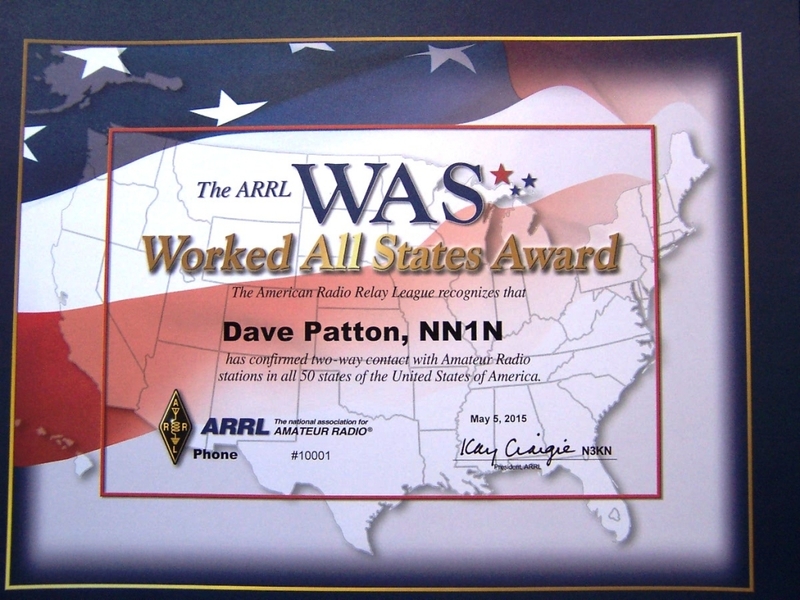 Thousands upon thousands of awards have been issued to hams around the world. In ARRL’s 101st year, we have redesigned the certificates and the program in hopes of streamlining and improving the award program. The WAS program has many options which are listed below. 2) The WAS (Worked All States) Award is available to all amateurs worldwide who submit proof with written confirmation of contacts with each of the 50 states of the United States of America. 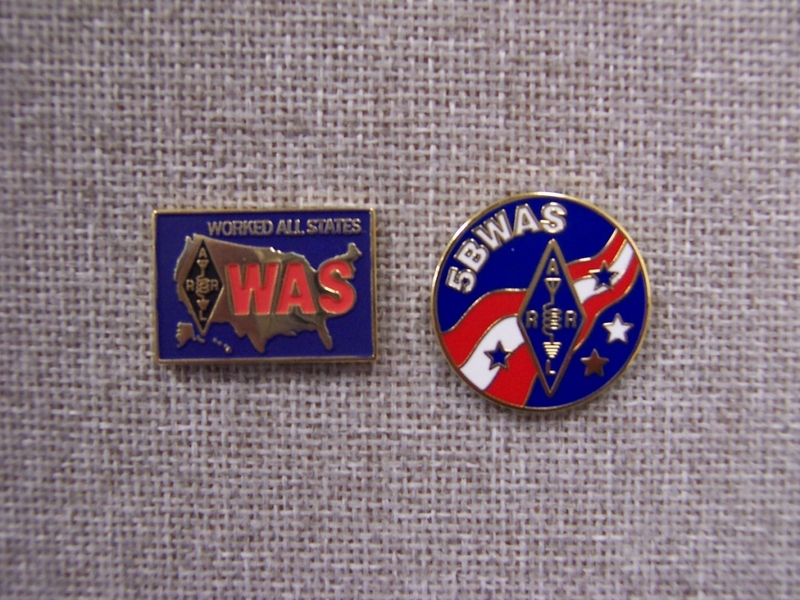 Amateurs in the U.S. and possessions must be members of ARRL to apply for a WAS. Applicants from outside the U.S. are exempt from this requirement. 3) Two-way communication must be established on amateur bands with each state. There is no minimum signal report required. Any or all bands may be used (with the exception of 60 Meters). The District of Columbia may be counted for Maryland. 4) Contacts must be made from same location, or from locations no two of which are more than 50 miles (80 kilometers) apart. Submission of an application serves as affirmation of abidance to the distance rule. Individuals may apply for and be granted multiple WAS awards, including WAS achieved from different, or multiple locations each of which are in different 50-mile circles (i.e. , from different QTHs or portable locations). 5) Contacts may be completed over any period. Contacts must be confirmed in writing, preferably in the form of QSL cards, or via Logbook of the World (LoTW). Written confirmations presented for inspection must be original – no photocopies are allowed. Confirmations must show the applicant’s call sign, band, mode, date and time, and indicate that the QSO was two-way. 6) Contacts made through repeaters or any other power relay method cannot be used for WAS credit. A WAS award is available for Satellite contacts. All stations contacted must be “land-based stations.” Contacts with ships, anchored or otherwise, and aircraft cannot be counted. 7) Headquarters personnel reserve the right to inspect cards (at ARRL’s expense) from any application in order to maintain the integrity of the program. Failure of the applicant to respond to inspection requests may result in disqualification from the WAS program. 8) False statements on WAS applications or submission of forged or altered cards may result in disqualification. It is best to simply not submit QSLs for any award which have been altered or marked over. The decision of the ARRL Awards Committee, regarding any issue with which it is tasked, is final. a) Mixed WAS. Confirmations for QSOs confirmed using any mode or combination of modes. Endorsable with stickers for each band (excluding 60 Meters). b) Phone WAS. Confirmations for QSOs confirmed using any voice mode or combination of voice modes. Endorsable with stickers for each band (excluding 30 Meters and 60 Meters). c) CW WAS. Confirmations for QSOs confirmed using CW. Endorsable with stickers for each band (excluding 60 Meters). d) Digital WAS. Confirmations for QSOs confirmed using any digital mode or combination of digital modes. Endorsable with stickers for each band (excluding 60 Meters), and for each digital mode (i.e., JT65, FSK441, PSK31, RTTY). e) RTTY WAS. Confirmations for QSOs confirmed using RTTY. Endorsable with stickers for each band (excluding 60 Meters). f) Satellite WAS. Confirmations for QSOs confirmed using any mode or combination of modes using any satellite. g) 5 Band WAS (5BWAS). Confirmations for QSOs using any mode with all of the 50 states on each of the following bands: 80 Meters; 40 Meters; 20 Meters; 15 Meters; and 10 Meters. The 5BWAS certificate may be endorsed with stickers for other bands and stickers for modes. The 5BWAS plaque may be endorsed with metal plates for other bands. h) 160 Meters. Confirmations for QSOs confirmed using any mode or combination of modes. Endorsable with stickers for each mode. i) 50 MHz. Confirmations for QSOs confirmed using any mode or combination of modes. Endorsable with stickers for each mode. j) 144 MHz. Confirmations for QSOs confirmed using any mode or combination of modes. Endorsable with stickers for each mode. k) 222 MHz. Confirmations for QSOs confirmed using any mode or combination of modes. Endorsable with stickers for each mode. l) 432 MHz. Confirmations for QSOs confirmed using any mode or combination of modes. Endorsable with stickers for each mode. m) 1296 MHz. Confirmations for QSOs confirmed using any mode or combination of modes. Endorsable with stickers for each mode. a) Please refer to the latest fees posted online or at the end of this document. QSLs, application forms and record sheets may be submitted to an approved ARRL Special Service Club HF Awards Manager (via mail or in person, please contact the Manager for instructions). ARRL Special Service Clubs may appoint HF Awards Managers whose names are posted online at arrl.org/was-card-checker-search. Additionally, DXCC Card Checkers may, at their option, check WAS applications. DXCC Card Checkers can be found at arrl.org/dxcc-card-checker-search. Cards checked by an HF Awards Manager or DXCC Card Checker do not have to be sent to HQ. The Card Checker will send the edited and signed application form to HQ. The applicant should supply the postage and envelope to the Card Checker, at his/her instruction. b) In lieu of using a local Checker, you may send QSLs and applications to HQ for checking. All such applications sent to HQ must include sufficient postage to provide for safe return of the QSLs via trackable shipping. Please ensure that your QSLs are sorted in the same order in which they appear on the record sheet(s) so the Card Checker will not have to struggle with your application. c) It is OK to supplement a LoTW application with QSL cards. It is preferable to complete the LoTW application first, while noting in the application that the missing state confirmations will be checked from QSLs and sent separately. In such an application, the LoTW application will be used at HQ to finalize the charges and take payment.